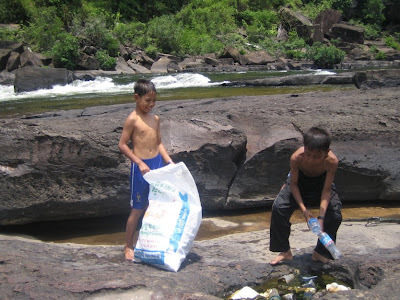 After the recent Khmer new year one of koh Kong’s and Cambodia’s most beautiful natural areas and waterfall was left in a shameful mess of litter from visiting day trippers, in a effort to clean it up and promote awareness to the kingdoms litter problem oasis resort sent some youngsters who care about their country to the falls, to collect the litter left and try to restore its beauty, the boys collected bags full of litter and bought them back to be disposed of in town. The 3 young pioneers expressed shame at their elders who throw litter down and said,” they are supposed to teach us being older, but we can see the wrong in the mess they have left and want to keep our country clean”. Mr.Jason.Webb of oasis resort commented,” tourist are constantly commenting on the litter problem in the kingdom and I have been all round the world and consider Cambodia to have some of the most beautiful scenery in the world, but also it is one of the most littered countries which is a shame. When the people come to visit on holidays from Phnom Penh they all wear Buddhist pendants round their necks, then insult Buddha by destroying and littering what is sacred to him, which is the nature and environment. 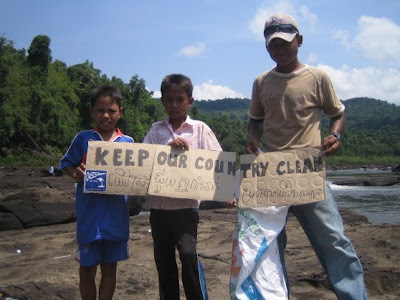 I hope by the actions of these wise children the older people can learn for the future development of this country, and hope more businesses can help in preserving the surrounding beauty of koh Kong’s precious nature and scenery”. xứng tỉ thí với đại sư huynh của chúng ta. - Huyền Đạo tông làm sao lại phái ra một kẻ đáng xấu hổ như vậy? - Đại Trụ sư đệ! Đồ đệ của ngươi rất tốt.